I'm going to admit it right now: I'm a comic book geek. It seems odd to say this today, with the cool factor associated with superheroes these days, but in the era before Robert Downey, Jr. was Iron Man, liking comic books was a sure-fire way to ensure that you would not have a date for the prom. But it wasn't always that way. Go back even further, during the golden and silver ages of comics; every boy from the age of five on read and re-read monthly picture books with titles like House of Mystery, Wiz, Detective, Planet, and Boy Commandos. Girls had romance stories marketed for them and of course, Wonder Woman to satisfy the seemingly universal longing for stories about people with powers beyond our own mundane humanity. The tobacco industry has a great marketing tool for the poison they peddle: They get kids hooked when they are young and those kids buy cigarettes for the rest of their lives. Try as they might, publishers of comic books could not keep their readership into adulthood. By the time most people get beyond adolescence, whiling away the hours with the radio on, reading fantasies about beating up bad guys and zapping monsters with laser-eye beams lose out to other interests. But for some of us, comics were an addiction as bad as nicotine. By the time I was out of college, Books Galore was saving 10 different titles for me every month behind the counter. The only thing keeping me from buying more was that I had a design job at a silkscreen company that paid jack squat. The job I really wanted – like so many of my fellow comic book geeks – was to draw superhero comics for DC or Marvel. (Heck, I would have worked for Eclipse or Charlton, even.) It had been my dream since I was 12. Alas, the closest I have come to worldwide comic art fame is the bi-weekly cartoon which you, our dear Erie Reader readers, get to suffer through each time someone in Erie politics does something stupid. Which means that I have not accumulated great amounts of wealth and have had to cancel all my subscriptions to the seemingly endless list of overlapping X-Men titles. I get my comic fix at the library now. But that dream of doing superhero comics is not dead. In fact, it has new inspiration: The amazing work hanging at the Erie Art Museum right now is re-stirring my geek blood! And since I no longer have to worry about a date to the prom, it may be time to re-submit a portfolio to Stan Lee. It's telling how popular comic books are these days by the fact that Stan Lee himself is a pop icon. He is the co-creator of Iron Man, Spider Man, Thor, Hulk, and about a million other popular characters. But are you aware that Jack Kirby, the co-creator of Captain America, is represented in this show with an original page from a Captain America book? And just as geeky-cool – Spider Man co-creator Steve Ditko has a panel on the wall from one of the first Spider Man comics. In fact, it's the first appearance of the Green Goblin, ever! And guess who owns it? The Erie Art Museum! Okay, okay, I'm getting worked up into a fanboy frenzy here. Seriously, if you are a comics guy, it's hard to not get excited about this show. To a connoisseur, some of the drawings in this collection are on par with a Rembrandt or a Picasso. 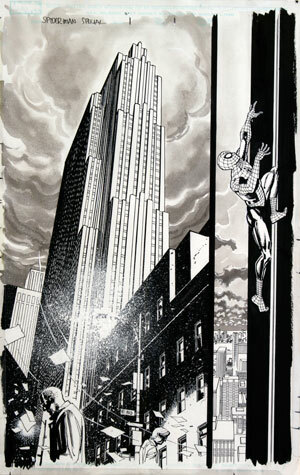 John Vanco, director of the Erie Art Museum spent three years putting the original Comic Book Art Show together. It opened in 1979 and toured all around the country for 12 years – The Erie Art Museum's most successful touring collection. Since collectors did not value this work back then, much of the early work was simply thrown away. Vanco says, "It wasn't easy. I was pretty diligent tracking down this artwork." That makes it rare to have a collection this exceptional. And since the Erie Art Museum owned all of the work in the original show, it did not need to be broken up. It therefore became a huge hit with museums around the country that were starting to realize the artistic value of these admirably rendered and inventive drawings. Now the original collection is back in Erie, but it has some new and awesome additions. One of the most prolific pencilers and inkers in comic's history, Klaus Janson loaned a large body of his original drawings to the Art Museum to grace the entire west wall. It's fascinating to see how the styles vary despite being from the same artist depending on the mood of the narrative, the layout of the spread, and whom Janson collaborated with on the story. The Daredevil pages he did with inker Bill Sienkiewicz are especially telling because you can see the unmistakable style of both artists showing through. I only wish Janson had submitted a couple panels from his collaborations with Frank Miller to share with us, especially since he was the inker for The Dark Knight Returns, maybe the most influential comic written in the last 30 years, which along with Alan Moore's Watchmen ushered in the modern age of comic books. This may seem hard to believe since I've done nothing but gush about this show from the beginning, but I haven't even told you about my favorite part! On the east wall, John Totleben, Erie's own comic book superhero, is represented with probably the most impressive craftsmanship in the show. An insanely detail-oriented and meticulous inker, Totleben's work is instantly recognizable by anyone who regularly read DC's Swamp Thing. Working with Alan Moore and penciler Stephen Bissette, Totleben's singular inking style almost single-handedly defined the look of the spooky, otherworldly swamps and small towns inhabited by the characters while giving even the monstrous Swamp Thing a manifest humanity. The original black and white drawings are fascinating to dissect with your eyes. 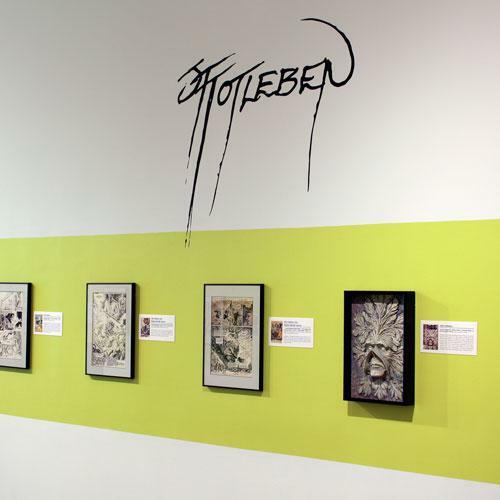 When discussing the universality of art, Totleben declared that "Michelangelo was just drawing with a chisel." Which is a fascinating polarity, since his work always looks as if it was sculpted with a pen. Whether you are a comic art geek from way back like myself, Totleben, and Janson all are, and wish to rekindle your love of all things super, or are looking to embrace the history of a pop culture phenomenon, this exhibit is a fascinating look at the minds and drafting tables of some of comics' greatest artists. And bring along the person you wanted to go to the prom with – because being a geek these days is actually kind of cool. Art of the Comic Book: Original Works from Klaus Janson, John Totleben, and the Museum's Collection. Erie Art Museum - Bacon Gallery, 411 State St.